For the second year in a row, American Atheists is pleased to partner with The Outreach Program, a nonprofit organization that works to provide safe water, food, medical care, and education to those in need, here in the United States and abroad. The Outreach Program organizes food packing events for charity across the nation. To date, The Outreach Program has helped provide more than 330 million meals. 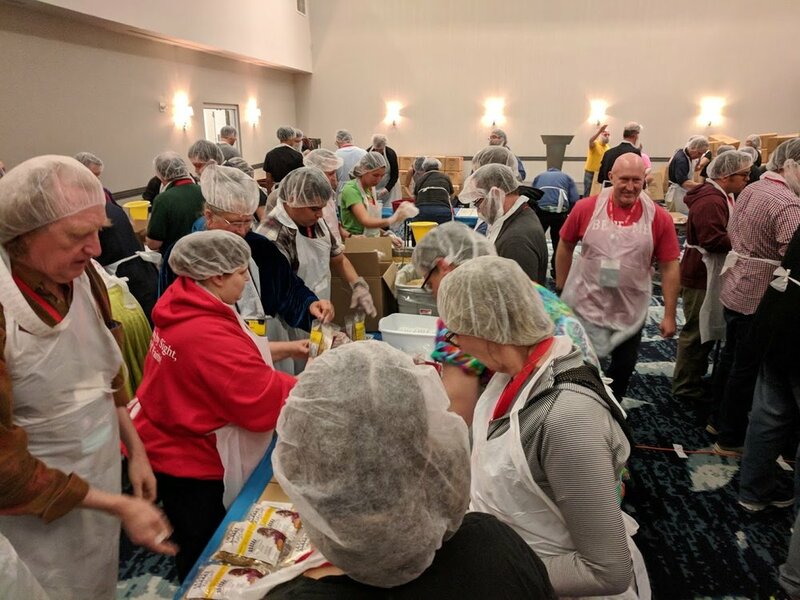 American Atheists invites you to help us pack 50,000 meals for charity by raising $15,000 or by volunteering at the National Convention! That’s right: A single meal is just $0.30. If you’re attending the convention, we need your help Sunday at lunchtime! We’ll provide the gloves, aprons, and hair nets — you just bring yourself! We’ll once again demonstrate that two hands working (or, in this case, a few hundred!) can do more than thousands clasped in prayer. If you’re not able to attend, we invite you to support our work and make a tax-deductible contribution to put food on the plates of folks in need in Cincinnati. A gift of just $15 means 50 meals on the shelves of a food pantry in the area. Please make a tax-deductible donation today to support our 2019 convention service project!